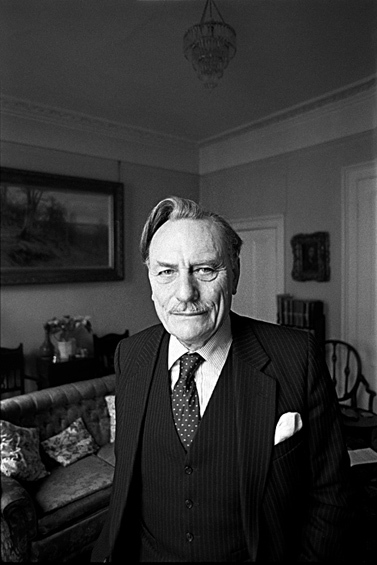 Enoch Powell, Eaton Square, 1984. Photo © Derek Ridgers. Irrespective of his ridiculous views on race relations, Enoch Powell was certainly one of my strangest ever subjects. I was commissioned to photograph him by the NME and, together with the writer Mat Snow, we turned up at his very grand flat in Eaton Square to meet a guy who seemed determined, for some reason, to try to make us laugh. For someone who achieved a starred double-first from Cambridge University, and who was often referred to as the greatest political mind of his generation, he struck me as a bit of a twit. To start with, he began by deriding my accent and the way I talk. He enquired as to whether I might be an Australian? I’m a Londoner, born and bred and though my accent isn’t of the typical gor-blimey cockney variety, it’s never (outside of the US) ever confused anyone before. Then he asked me about the origins of my name and started to try to find something funny about that. Next he spoke to a woman who had been detailed to bring us some tea and called her “dear” and invited us to speculate on what his precise relationship with her was (it was his wife). All the while he was grinning at us like Sid James in a Carry On film. Enoch Powell was a proud man but, in my judgement, by this stage of his political career, a little sad. © Derek Ridgers. From The Ponytail Pontifications.